There once was a time when I just went to the grocery store and browsed all the different sections without any specific list or idea of what I’d be cooking. Looking back now I have absolutely NO idea how I made any coherent meals. Well the truth is, I probably didn’t without MULTIPLE trips to the grocery store for odd ingredients or produce I didn’t know we’d need. Does this sound like you? Going to the grocery store, spending 80 bucks and then an additional 25 or so dollars every few days in between for all the “other” stuff. It adds up! I don’t know when I started actually sitting down and planning out our meals for the week but it has really been life changing. We save money AND our food waste has dramatically decreased. I was throwing away produce left and right prior to having a plan. No more “Oh this broccoli looks tasty!” Only to forget about it in a week and find mold growing a community in your veggie crisper drawer. No stir-fry tonight, honey! My process is pretty simple. I spend a couple hours over the course of a few days scouring recipes online, and looking through my cookbooks to find inspiration for our meals for the week. I typically plan about 6 dinners, leaving room for eating out or finishing up leftovers. I do not plan out breakfasts or lunches because those are usually very similar day-to-day, and week-to-week. For example, currently I’m loving eating a big bowl of oatmeal in the morning after my runs and workouts. My kids typically chow down on some cheerios, fruit or granola bars. Lunches are typically reserved for leftovers, although I do add in extra veggies and I always have grains on hand for if/when we don’t have leftovers. I also love to buy the ‘Chickenless’ strips and Meatless meatballs from Trader Joe’s for my boys for their lunches-along with pasta, pb&j, etc. This is the grocery list for the FREE meal plan to the right! I list out our meals and then break down my shopping list into PRODUCE, PANTRY, COLD, AND HOME GOODS (for toiletries, diapers, dog food, etc). 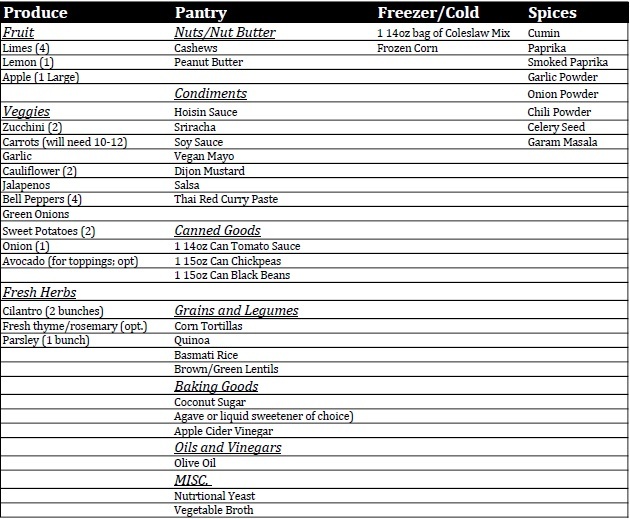 When I do meal plans for folks I usually add a SPICES column too. We go shopping once/week and usually spend around 150-180 bucks. By far, the majority of our grocery items are from the produce section. Now, we have never shopped at any of the big stores like Costco, BJS’s, etc. OR Aldi’s so I haven’t tried too hard to get that grocery budget down much but I know that I could! I’ve put together this 5 day gluten-free, VEGAN MEAL PLAN FOR YOU! Click HERE for the PDF you can save or print! for MORE sample Meal Plans check out THIS QUICK POST with more plans you can save, download and print!